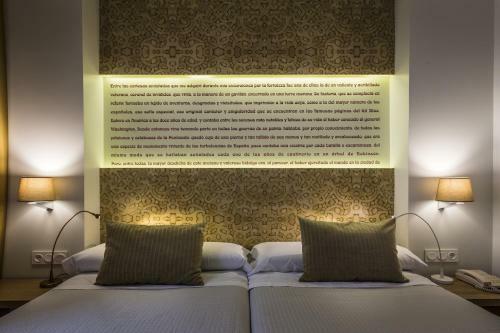 Located in the district of Centro this elegant hotel is within easy walking distance of the Madrasah of Granada, Royal Chapel of Granada and Granada Cathedral. Rooms are air conditioned and an internet connection is provided free of charge. The Hotel Comfort Dauro 2 provides many services including an express check-in and check-out feature, family/oversized rooms and valet parking. The hotel also offers a coffee bar, a cafeteria and meeting rooms. For guests' convenience, the hotel also offers room service, which is available during certain hours. The Hotel Comfort Dauro 2 offers large and comfortable rooms equipped with cable / satellite channels, a mini bar and complimentary toiletries. A hair dryer, a private bathroom and a seating area can be found in each room of the hotel. A shower, wireless internet access and a desk with an electrical outlet are also included in each room. To ensure your day gets off to a good start, the hotel offers a buffet breakfast daily. For other meals, there are many restaurants and cafés located nearby. A wide variety of dining options can also be found in the surrounding area. The location of the hotel allows guests to easily reach many tourist attractions by foot. The hotel's multilingual staff will make sure your stay is comfortable. This hotel is 1162 metres from the Alhambra entrance, 408 metres from Plaza Nueva (the absolute centre of Granada), 1753 metres from the train station and 3288 metres from the bus station.